Innovation is the essence of development – today we use modern Human Resource Information Systems that fully integrates payroll with with important employee documentation for speed, accuracy and efficiency. Murray Premises is a designated, national historic site and the oldest collection of mercantile buildings in Newfoundland related to the fishing industry. 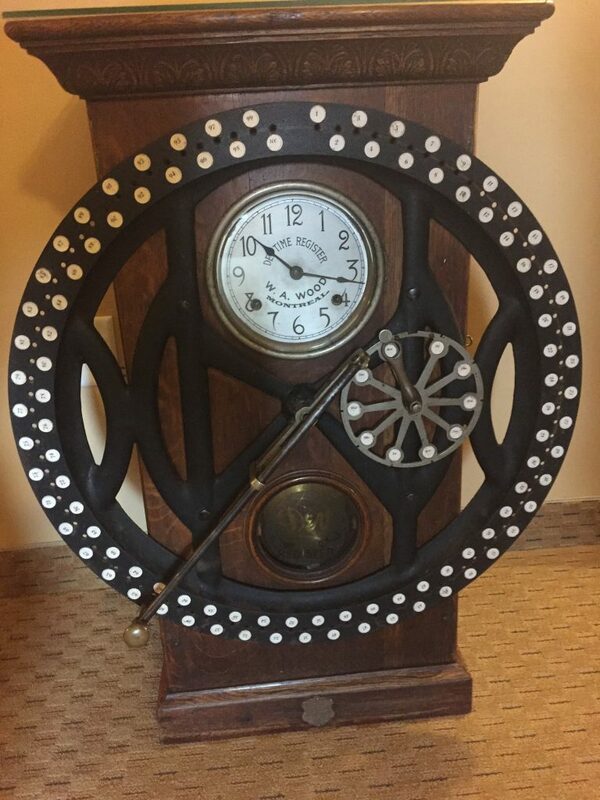 The devise below is the original time clock for the employees and dates back to the late 1800’s. The Dey’s Dial Recorder, from W.A. Wood, Montreal shows the number of each employee around the circumference of the large ring on the front of the machine. The employee recorded their starting and stopping time by positioning the pivoted pointer arm to their own number and then pressing it into the guide hole, thereby printing the exact time opposite their number on a prepared sheet in the machine.